In a safe and caring environment, rooted in Gospel teachings and Catholic values, students will work towards achieving their full potential and define their purpose. 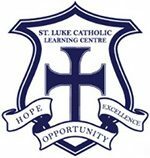 St. Luke Catholic Learning Centres affords students who are experiencing challenges in their home school an opportunity to learn in a safe and supportive environment. Students receive Tutorial-style instruction with small class sizes to assist in meeting their pathways goals. Social and emotional needs are supported through school-based and community resources. Daily attendance and commitment to achieving personal goals maximizes the chances for success in this program. The staff at St. Luke is committed to supporting both academic needs and the well-being of the students in our care.